Discovering the world and leaving one’s mark - KRASS e.V. Every Wednesday when the group room of the refugee accommodation opens its doors, children and teenagers between 3 and 16 years enter a creative world. And they leave their mark! 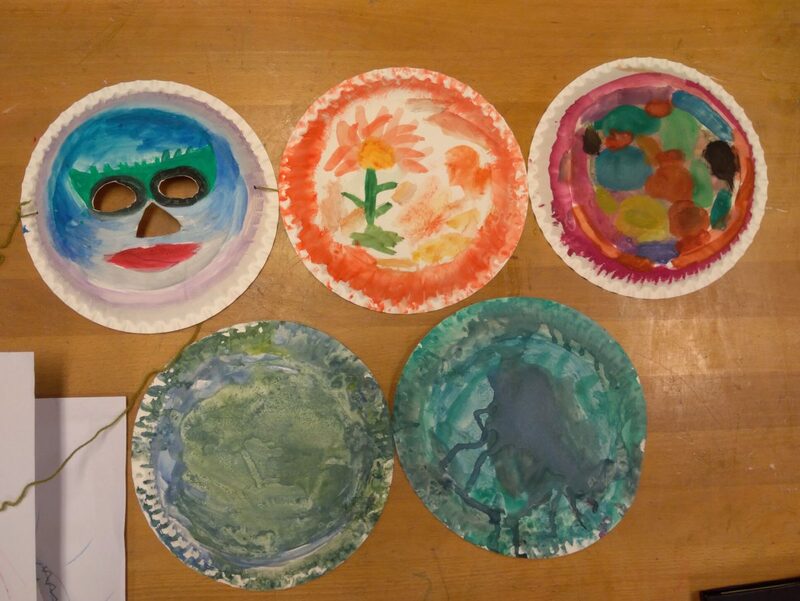 Today’s topic is carnival and colorful masks are going to be made. The essential material for the KRASS’ course is provided by the creative course instructor Mareike van Elsbergen. Since the end of 2006 the art therapist with a diploma has been running the course, together with Sibel Durmaz as an offer for children and teenagers with displacement experience. Uniting them is the wish to tie children with art and culture and to create a space for encounter at the same time. The participants are asked to bring their own impulses and to leave their personal trails by using different materials: “During childhood it works best, because one is curious and free from the restrictions which we face in adult life,” says Mareike. “Sometimes the course is an opportunity for the participants to talk to the trainees about things which are on their minds,” explains Sibel Durmaz. The early childhood educator has been there since the beginning, and has accompanied many children on their creative journey: “At the beginning some of the children were very calm and introverted.“ Today she is being welcomed by these children with a warm embrace. Her daughter, Belgin Durmaz, on her first day in the accommodation, never thought that she would stay for such a long time. By now the 14-year-old has been involved for a year at the Meineckestraße. “It is a nice feeling to see how happy the children are to see you,” explains the gymnasium attender who has took the children into her heart. Sümeyye ist one of those children. She has been living in Germany for 4 years with her parents and siblings. To her the courses from KRASS e.V. are a possibility “to do cool stuff.” Sümeyye has captured the course instructor’s attention, because of her very active nature. The 4th grader quickly immersed herself into the group and is now helping new participants to overcome language barriers. Today she did not make a carnival mask, which does not mean that she is not going to celebrate carnival. Her costumes are ready to go, but she has not decided which one of them she is going to put on: “Either I am going to be a tiger or a witch,” she explains. Next week she will tell Belgin – that is clear! Back to the roots: Battles with a playful charachter!